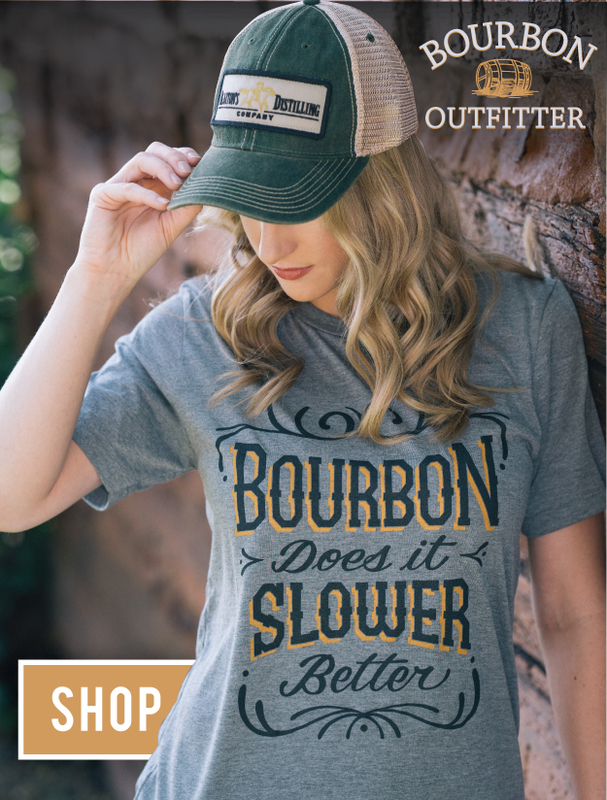 In the charming town of Clermont, KY lives Jim Beam, the largest brand in Bourbon. 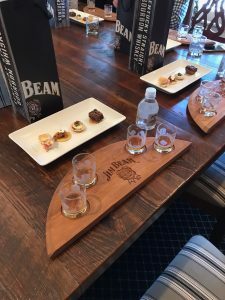 For the past four years, Jim Beam has offered an exclusive tour and tasting, Behind the Beam, for a behind the scenes look at every aspect of Jim Beam. Throughout the tour, guests see firsthand the varieties of bourbon the Jim Beam makes with an experienced guide who can answer any questions thrown their way. A few of us at the Bourbon Review headed down this week to take the tour for ourselves. 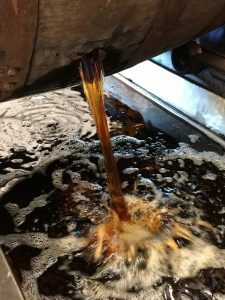 Highlights of the tour include the 5-story column still with 23 plates, the hands-on experience of filling and pouring out barrels, filling your own bottle of Knob Creek, and personalizing that bottle with your finger print. Visitors also get to see where all of the world’s Jim Beam White Label is bottled. The tour continues with a private tasting with Master Distiller, Fred Noe. 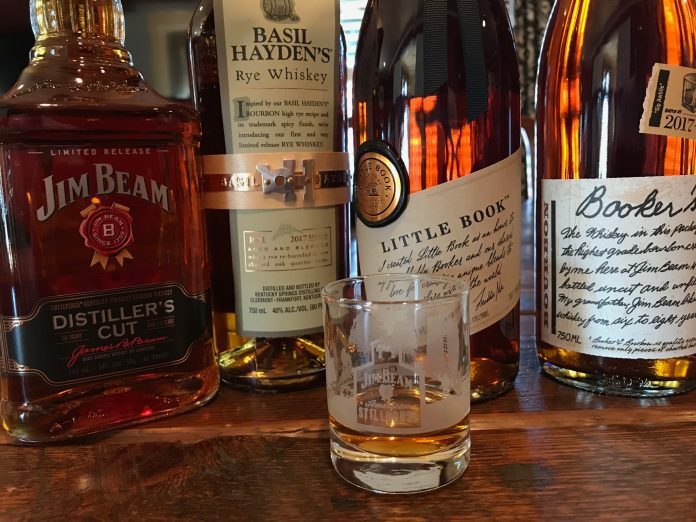 We headed to Warehouse D, Booker Noe’s favorite, to try a 13-year-old straight from the barrel as we listened to Fred describe the complexities of bourbon and give us a lesson on how to taste different whiskeys. 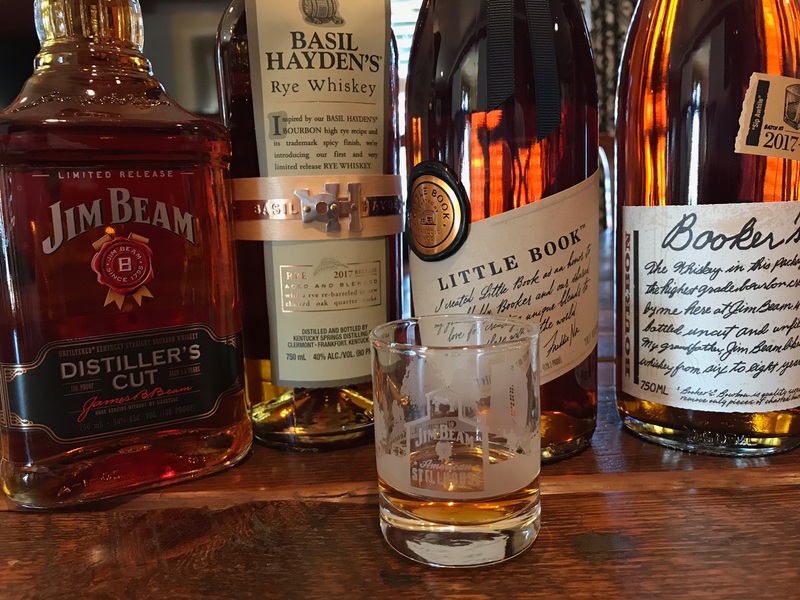 Finally, we moved on to the T. Jerimiah Beam Home where we ate lunch and sipped Jim Beam Limited Release Distiller’s Cut, Exclusive Release Basil Hayden’s Rye, Little Book, and Bookers 2017 Release (nicknamed the “sip a while” release). Lunch included classic southern fare – some amazing BBQ, Hawaiian Bread Rolls, brisket, chicken, Mac n’ Cheese, and baked beans. The best and most personal part of the tour was the tasting, not only because of the great whiskeys, but because of the even more amazing stories behind each bourbon told to us by Fred. Our favorite was about his son Freddy Jr., and Fred’s pride in watching him on creating such a unique blended whiskey in Little Book. Fred’s passion and understanding of Bourbon certainly lit up the room and gave us all a glimpse of the dedication it takes to craft these whiskeys. Cheers to Jim Beam, Fred Noe, and all the people who helped put on this one of a kind tour.